While Microsoft ended its security updates for Windows XP in 2014, AVG AntiVirus FREE continues to protect Windows XP owners with regular virus definition updates. However, we no longer provide program updates, new features, bug fixes, or support for Windows XP. Therefore, we strongly recommend all XP owners to upgrade to the latest version of Windows. Our free software combines data from our millions of users to provide you with the best in Windows XP security for your PC. We automatically push new virus definition updates to AVG AntiVirus FREE to give your Windows XP computer the ultimate in malware protection and to keep you, your PC, and your family safe online. Think you already have security with your Windows XP software? The built-in firewall is not enough, and Windows XP has no antivirus, no antispyware and no security updates. In fact, Microsoft themselves stopped supporting Windows XP back in 2014, meaning they no longer release security updates for it. And AVG AntiVirus FREE? Well we've got it all. Because when it comes to the security of your Windows XP PC, some risks just aren't worth taking. Upgrading your Microsoft Windows XP PC? 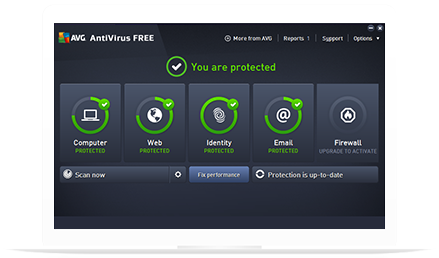 AVG antivirus gives you essential protection for your Windows XP PC, stopping viruses, spyware and other malware. It's also compatible with all the latest versions of Windows, so when you're ready to upgrade from Windows XP to Windows 7, Windows 8 or Windows 10, your AVG antivirus will continue working.